The highlights from a jam-packed conference season! What an amazing summer we had! We welcomed over 20,000 visitors to more than 160 conferences, meetings, summer schools and dining events here at the University of Leeds! The key theme to 2018 has been collaboration, as we hosted events which brought university departments, academic associations and charities together in partnership to deliver memorable experiences for delegates and organisers alike. We even won a prestigious Conference Award and a Sustainability Award for our collaborations, so you know where to come for award winning events! 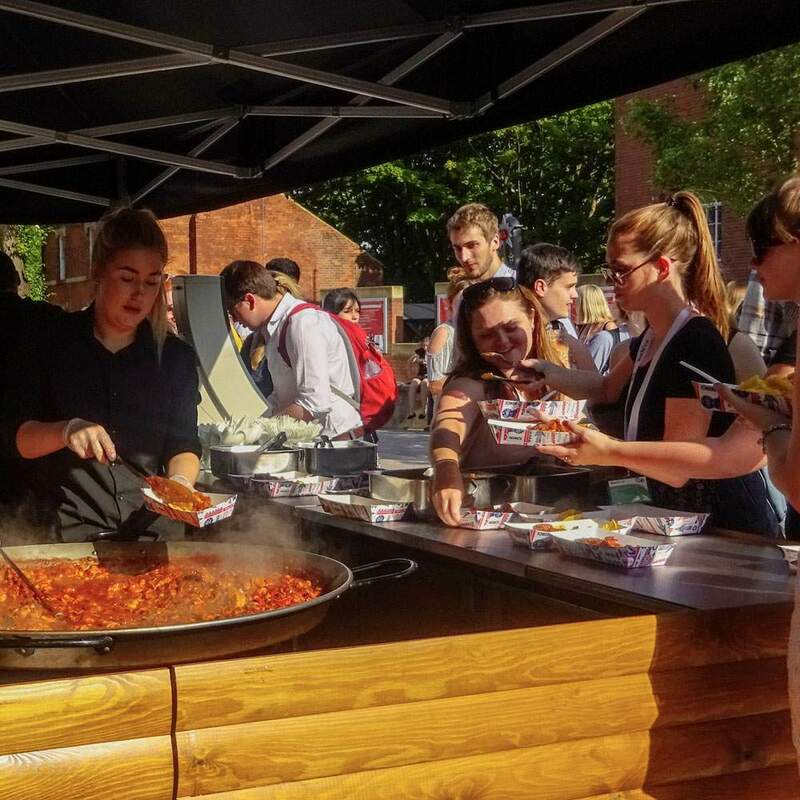 Now autumn has crept in we say hello to our student community, but we still have places you can book day meetings, fine dining, training days and more, so get in touch! More interested in seeing pictures? Have a look at the gallery for the best snaps from the summer. We kicked off the summer in celebratory style, as we hosted the hugely popular Staff Festival, which proved to be a record-breaking success. Thousands of people flocked to the campus celebrations, enjoying an entertainment extravaganza staged on a beautiful summer’s day. With the theme ‘A Festival of Making’, the packed programme of events included workshops, refreshments, live music, games and competitions for all ages. As a result, Pets As Therapy (PAT), this year’s chosen charity, benefitted from donations to the tune of £2,888.26. This year’s International Medieval Congress (IMC) marked significant milestones: the 25th Congress since its beginning in 1994 and the 50th anniversary of the Institute for Medieval Studies (IMS). The IMC saw a staggering 750 separate academic sessions comprising of 2,200 individual papers exploring all aspects of Medieval Studies. Where most paper proposals have historically focused on the European Middle Ages, this year boasted a dedicated ‘Global Middle Ages’ theme, reflecting the importance of links between medieval civilisations across the world. And the inaugural New Voices lecture was another first, dedicated to showcasing new perspectives in Medieval Studies from early career researchers. Displays and demonstrations of birds of prey, thrilling combat displays, medieval food, drink and crafts filled University Square. Huge smoke-breathing ‘dragons’ swooped and soared above the crowds. In July the Nutrition Society Summer Conference came to campus for the second time in its 77 year history. We welcomed 400 health professionals, policy makers, nutritionists, and academics from various Universities from around the globe. The conference was an excellent example of engagement online, with over 570 tweets using the official hashtag, #NSsummer18, indicating the high level of debate and conversation which took place over the three-day period. The conference aimed to not only inform and educate delegates but to practice what it taught. Reflecting the theme of the conference, careful consideration was made to source healthy, local produce and an activity programme was created for attendees, which included morning jogs and yoga. Delegates were able to enjoy the fantastic facilities that the University offered at every stage of the conference. This included a drinks reception at the iconic Parkinson Building, excellent on site accommodation at Storm Jameson Court and high quality lecture theatres in the Conference Auditorium, large enough to accommodate the many delegates attending. Over 400 attendees attended this year’s Communication Matters Augmentative and Alternative Communication (AAC) Annual Conference, which included over 80 presentations, a very popular exhibition of the UK’s leading suppliers of AAC products, social events and much more. Communication Matters is a UK-based charitable organisation, which works to promote the best possible communication for people with complex communication needs. They deliver training, support research and lobbying, to promote a vision where all individuals have a right to a ‘voice’ through the provision of equipment and ongoing support services. Lee Ridley, winner of Britain’s Got Talent 2018 and nicknamed Lost Voice Guy, is a Patron for Communication Matters. Since first hosting the conference at the University in 2013, MEETinLEEDS and Communication Matters have developed a unique and beneficial partnership, culminating in the award for “Best Partnership or Collaboration” at the Conference Awards 2018. The competition, open to pianists under 30 from around the world, has had a close relationship with the University of Leeds since its earliest days in 1961. For the first time The Leeds, as it is affectionately known, hit the road – taking the competition to the competitors. Starting with international first rounds shared across Berlin, Singapore and New York in April, 68 entrants were whittled down to 24 finalists from 16 countries and territories. They made their way to Leeds for the second round and semi-finals, held right here in the Great Hall between 6 – 14 September. Eric Lu, 20, from the US, was awarded first place at the finals at Leeds Town Hall on 16 September, in what is widely regarded as among the most coveted prizes in the musical world. The event was a glittering finale to the triennial piano competition which – with the University as its principal partner – has seen every aspect of the instrument celebrated by a wider audience than ever before. Also part of the piano competition – for which the University of Leeds is principal partner – is a large and varied range of concerts and events designed to run alongside the main competition. This included the Leeds Piano Trail – 12 beautifully decorated pianos across the city – an opportunity for anyone to play and enjoy the piano for free. Two recent Fine Art graduates, Sophie Bullen and Ollie Getley, were commissioned to prepare the piano here in Parkinson Court, as well as one located in Leeds train station. In what was the final event of the summer, the Oil & Colour Chemists’ Association (OCCA) celebrated its centenary year here at the University of Leeds, with a progressive and informative technical programme including speakers from academia and industry covering a range of science important to the colour chemist industry. Even though the association has a long and distinguished history, this was the first time all members were invited to assemble for a conference, making the University of Leeds the inaugural location for an event which is certain to grow in the coming years. The OCCA Centenary Conference provided a forum and networking for scientists, engineers and technologists from academia, government laboratories and industry. Attendees presented their key scientific discoveries and offered the association members a chance to share findings, exchange ideas, share insights, make new friends and renew old acquaintances. Taking place in the School of Chemistry and Parkinson Building meant the talks, exhibition and catering for the conference was accommodated within a short indoor walking distance. Subscribe to our newsletter for the latest news, tips and offers!